Cable TV and TiVo go together like peanut butter and jelly, or at least they did until now. The company that, for all intents and purposes, invented the DVR has, after 14 years, released one specifically designed for people who don't want to pay for a TV subscription. 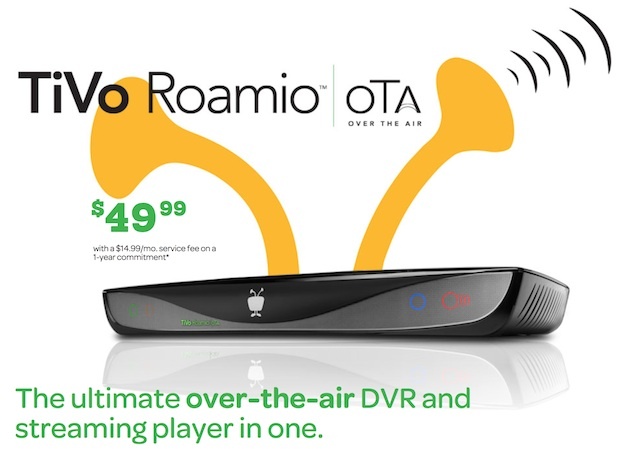 If you look past the marketing, the $50 TiVo Roamio OTA is actually the same as the standard-edition Roamio, but with a nonfunctional CableCARD slot and no option for Lifetime Service. So, is this the one box a cord-cutter needs? Just as important, is the price right? TiVo's latest is the best over-the-air DVR ever made, but the $15 monthly service fee (combined with the lack of a Lifetime Service option) means you're trading a low upfront price for some high long-term costs. Be the first to review the Roamio OTA DVR? 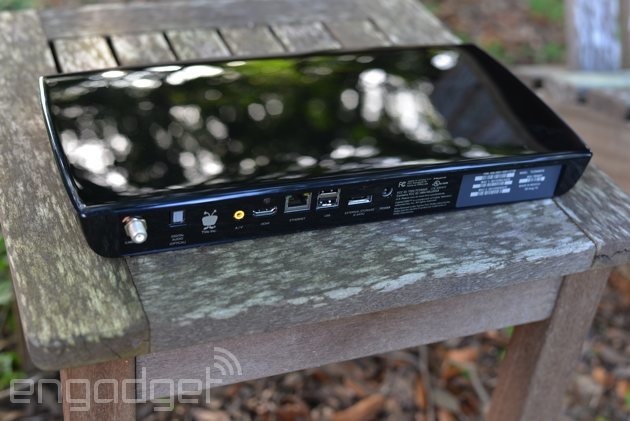 On the outside, the TiVo Roamio OTA is identical to the standard edition. Same 3.7-pound, 14.3 x 7.4 x 1.9-inch box with an external power supply. Same recording indicator and power LEDs. The same WiFi (802.11a/b/g/n), Ethernet and port selection (USB, coax input, optical and analog audio out). It even requires the same $15 composite breakout cable if you prefer not to use HDMI. No HDMI-CEC either; again, just like other TiVos. It also comes with a 500GB hard drive, four tuners and the ability to expand via eSATA. Unlike its more expensive sibling, though, these tuners only capture over-the-air signals. The ability to tune into ATSC content is a strong suit here -- I didn't have any problem picking up broadcast channels in my area with a $15 RCA antenna or a more expensive one from Mohu Leaf. The box itself is physically appealing, with its glossy piano-black plastic, faceless TiVo guy and textured gray material. I appreciated TiVo's industrial design efforts when I first reviewed the Roamio Pro, and the fit and finish is just as welcome on the new OTA edition. I've always disliked external power supplies and while I've learned to live with them, I haven't stopped complaining about the accompanying tangle of wires. Unlike the Pro, the OTA doesn't feature MoCA, but that can be overcome with a $50 accessory adapter (with yet another external power supply). The OTA also doesn't have an integrated TiVo Stream (like the Plus and Pro do), so streaming to your mobile devices will run you another $130. The stubby peanut remote (as I like to call it) is the same as on the rest of the TiVo Roamio lineup. That means it's RF instead of IR, doesn't have a backlight and can only be programmed with IR codes of TVs and audio/video receivers from an included database. It can't learn to control your TV and AVR using your existing remotes, though. I'm not still holding out hope that TiVo will release an accessory remote with a backlight and the ability to learn, but without a slide-out keyboard, like back in the Series3 era. One small, but very useful feature that the Plus and Pro have that the lower-end Roamio DVRs don't is the remote finder. I can't tell you how useful I've found it to press a button on my Roamio Pro DVR and listen for the TiVo theme music to help me locate my missing remote. 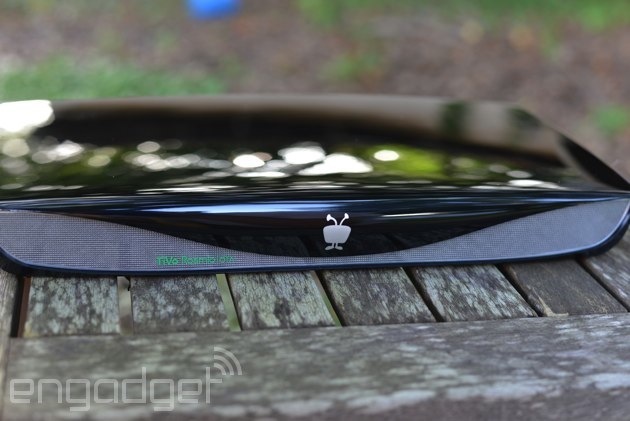 The TiVo Roamio OTA is also identical to its big brothers when it comes to software. It's every bit as fast, with the same features and the same third-party apps like Netflix and Hulu. Still, I'd like to take this opportunity to review the new features added to the Roamio lineup since I reviewed the Roamio Pro over a year ago. The two big additions are ones I've been complaining about as long as I can remember. The usefulness of the boring default Season Pass settings added in the spring 2014 release can't be overstated. I only wish I could get back all the time I've spent over the years setting every single Season Pass to keep all my recordings and to only record new episodes. Now, there's no longer a need to do this manually every time. It works exactly as you'd expect, in fact, but is limited to a few essential settings: record new and reruns, new only or everything; keep at most a number of episodes or all; and start or stop recording on time or add up to five minutes on either end. I'm not sure why TiVo didn't include the ability to choose a default "keep until" setting; maybe next year. The more interesting new feature came this summer and was quite overdue. Now the "My Shows" view makes it easier to sort through terabytes of recordings. In particular, a customizable third column lets you filter by category, as well as find episodes you didn't quite have time to finish. And the fact that it's configurable to the point it can be disabled completely means it's pretty much a complete win. Still, TiVo hasn't been successful at changing the way I find things to watch. The company has done some great things with What to Watch Now to help make the various viewing options slightly less overwhelming. This new third column in the UI improves things too, but I can't help but think there's more work to be done. It may be as simple as combining these two features into one. Perhaps a list view of What to Watch now (as opposed to icons) with the same configurable categories. I'm not sure, really, but the bottom line is: I like the direction TiVo is going in here and look forward to even more options for sifting through all that content. I'd be remiss if I didn't address the remaining standard-definition menus on the TiVo Roamio lineup. 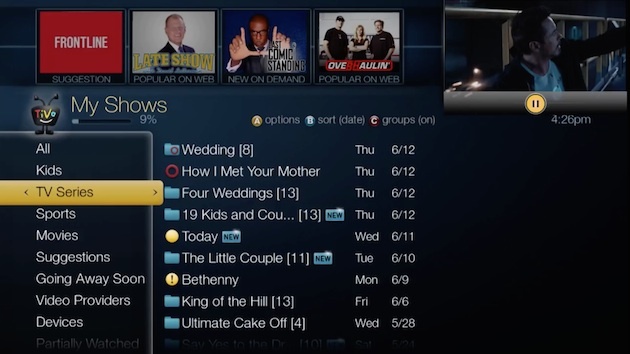 It seems some of the TiVo faithful are very upset that the time and care hasn't been taken to redesign every single menu of the TiVo experience in HD. But as a self-proclaimed HD snob, I can't say I agree. I understand it may annoy people when the UI switches back and forth, but at the same time, TiVo has to make difficult resource-allocation decisions; redesigning barely used UI elements is clearly not the best use of TiVo's time. Every new feature and setting is designed with HD in mind and it's surely just a matter of time before every menu gets the HD treatment -- it's only been four long years. The question TiVo hopes to answer is if the Roamio OTA will appeal to the estimated 7.6 million US households that don't subscribe to cable. Netflix, Hulu and the like get lots of credit for enabling people to watch TV without paying big bucks for a premium cable or satellite subscription. That means, though, that the antenna remains your best friend if you're a frugal TV fan. And just because you choose not to spend your hard-earned money subscribing to bunch of channels, that doesn't mean you don't want the 21st century luxury of a DVR. There's no shortage of startups attempting to fit this need, but unfortunately, when it comes to DVR functionality, most aren't even as good as the original TiVo from almost 14 years ago. Simple.TV, Channel Master, Tablo and others are doing their best, but are mostly just realizing how difficult it is to create a robust DVR platform. In particular, reliability, fit, finish and usability are usually second to content -- all areas where TiVo excels. Then again, though TiVo was one of the first to offer Netflix streaming almost six years ago, the company has fallen behind in more recent years with many, many missing options like: WatchESPN, Vudu, HBO Go, Amazon Prime, Epix, Crackle and CinemaNow. To be fair, not all of these will appeal to cord-cutters, as services likes WatchESPN and HBO GO require a cable subscription to watch (and who would ever borrow their friend's sign-in info?!). But the absence of Vudu and Amazon Prime are pretty glaring; I can only hope the rumors of these services coming to TiVo are true. Until that happens, though, you might be unlikely to get down to one box; you might additionally need a Roku, Fire TV or Apple TV. Then there are all those network apps, which would offer a good backup, in the event that your OTA setup lets you down. 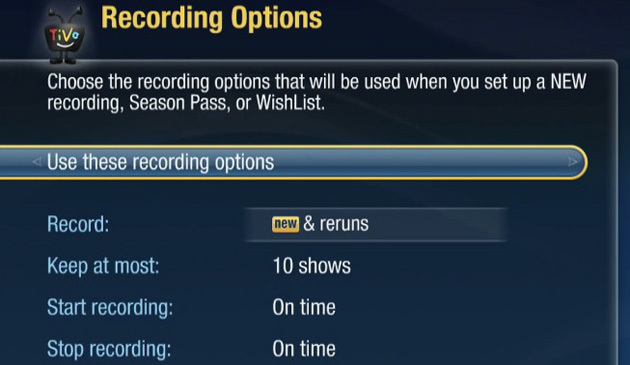 Even with the streaming options that TiVo does offer, there's room for improvement. Some of the streaming apps on TiVo aren't as good as the versions available on Roku and other boxes, with Pandora being one major example. Accessing these streaming services isn't as easy as it is on other boxes, but that has a lot to do with the fact that TiVo is a DVR first and a streamer second. On top of that, the user experience isn't as cohesive as the ones that the Xbox and Apple TV deliver since TiVo's streaming apps aren't customized to match the TiVo experience. 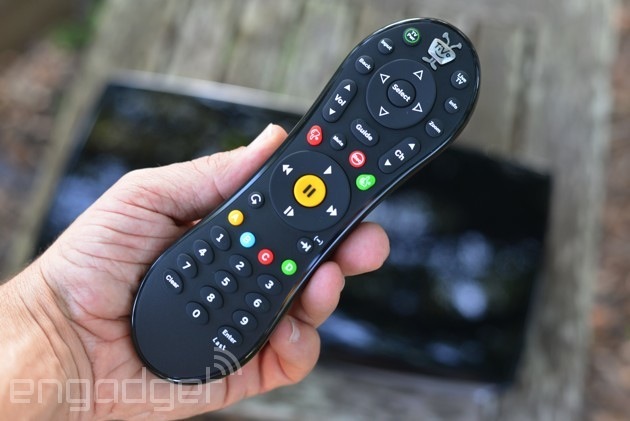 Ultimately, the biggest problem with TiVo is the price. At $699 with Lifetime Service, the standard TiVo Roamio isn't exactly a low-cost solution and so TiVo hopes that it can entice cord-cutters with essentially the same box (for someone with no interest in paying for cable) for $50, plus $15 a month. The problem is the service charge, which almost no one believes is worth the price of a Netflix and Hulu subscription combined. The service, of course, is little more than a way for TiVo to subsidize the price of the hardware and provide people with a low upfront cost. But without a Lifetime Service option, you'd have to really be missing the big picture to go with the cord-cutter edition -- it takes about three and a half years at $15 a month to catch up to the $699 price of the standard Roamio with Lifetime. The TiVo Roamio OTA is interesting. Marketing a box to those who don't want to pay for cable while at the same time selling boxes to cable companies, and to customers of cable companies, is like walking a tightrope -- one I think is manageable. The real problem is that while I believe the TiVo Roamio is the best over-the-air DVR ever available, the low upfront cost isn't worth the higher total cost of ownership (the standard Roamio works with OTA or cable and is cheaper after three and a half years when you buy Lifetime Service). Then again, if you want a DVR without a cable subscription, the Roamio OTA is virtually your only option. What's more, it's not like you can completely replace it with a Roku or Apple TV; either way, you're going to sacrifice some content. An OTA DVR, for example, has access to live NFL on CBS each Sunday, but TiVo doesn't have nearly as many apps as either Roku or Apple. Given that, we'll say this: If you're interested in cutting the cord, but you're not ready to shell out hundreds up front on a regular TiVo box with Lifetime Service, then $50 to get started (plus $15 per month) isn't a terrible deal. But that's not saying much.